This weekend has been much better than last weekend. Friday night I went for Mexican food in Chalfont. Saturday morning I met up with Tom from Reading and we rode Salisbury up near Bethleham, PA, which is about an hour north of my place. I was late leaving, and Tom called me to make sure I was on my way. He did a short loop while I continued my trek north. At 9:20 AM, we were the only cars in the parking lot. This place seemed rocky, but it had a lot of good trails. I think my two 24oz Hoegaarden beers with my Mexican the night before was not helping my riding skills. Tom left me behind. For a guy that rides a hard tail and with toe clips in running shoes, Tom rides fast. He was leaving me behind. But I had a cunning plan. Tom dropped his water bottle. The bike he was riding was new to him. It had belonged to Rob (Secret Asian Man) but Tom bought it to have a spare (his real ride was in the shop) and a bike for his son. 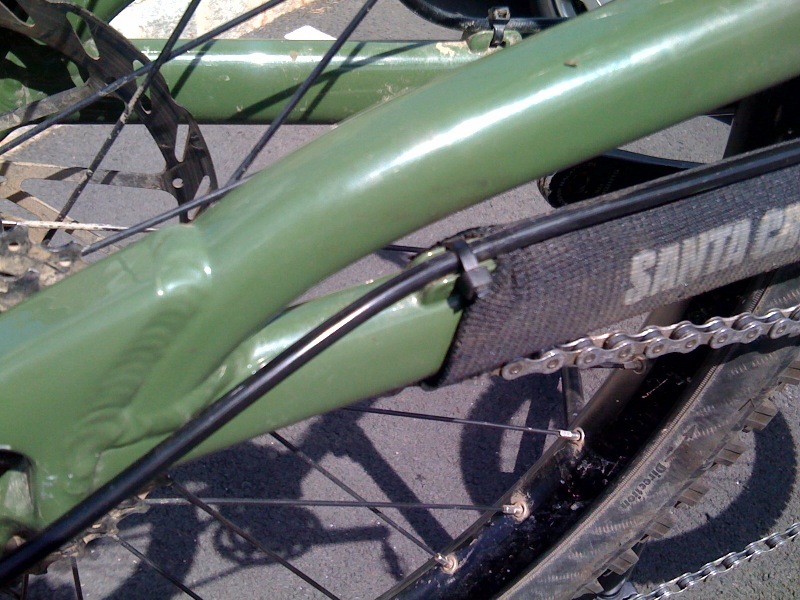 The bottle cages were a bit loose and one of the bottles dropped out. While riding (behind Tom), I noticed a water bottle at the side of the trail. I thought about stopping and picking it up, but I see bottles all the time, and I thought was using a Camelbak. I was most likely in oxygen debt trying to keep up with Speedy so my brain was even less funtional than usual. 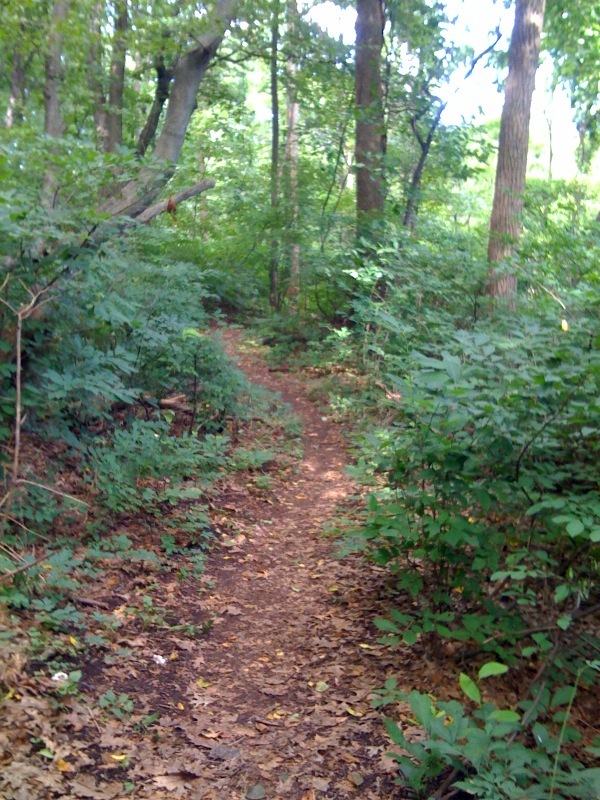 About 20 minute later, and several trails, Tom mentioned his dropped bottle. I mentioned where I saw it. 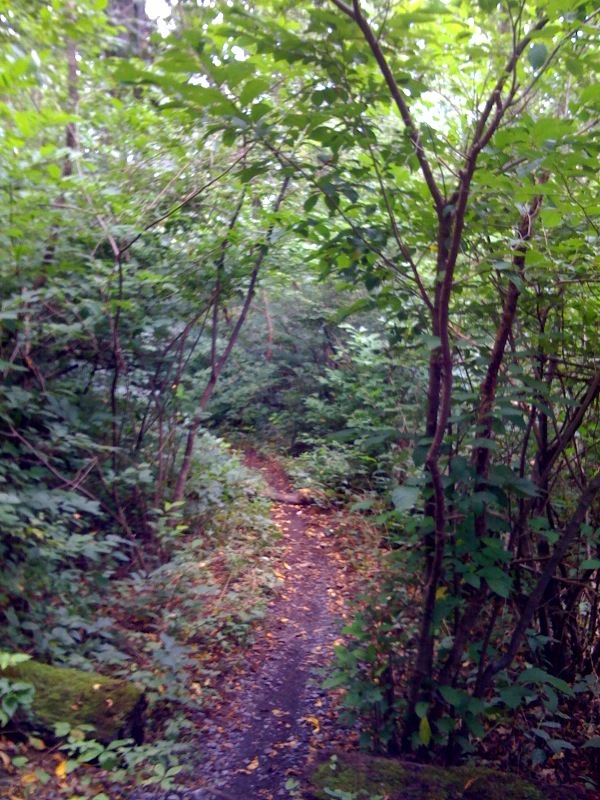 The plan was to ride back along other trails, and do a loop and see if we found it. See, this was all part of my cunning plan to be able to keep up with Tom. As time went on, I kept Tom in my sights for longer and longer periods of time. No more was he disapearing around a corner leaving me to breath his dusty left-overs. Now I was keeping up with him and actually gaining ground on him at times. But no evil plan, however cunning it may be, goes unpunished. Shortly after we stopped at the far east of the trails, near the train tracks, I went ahead (for the first time today, yet more evidence that Tom was sagging for lack of Gatorade). Shortly thereafter, I had a wardrobe malfunction. Fortunately, for Tom, it was my right shoe. 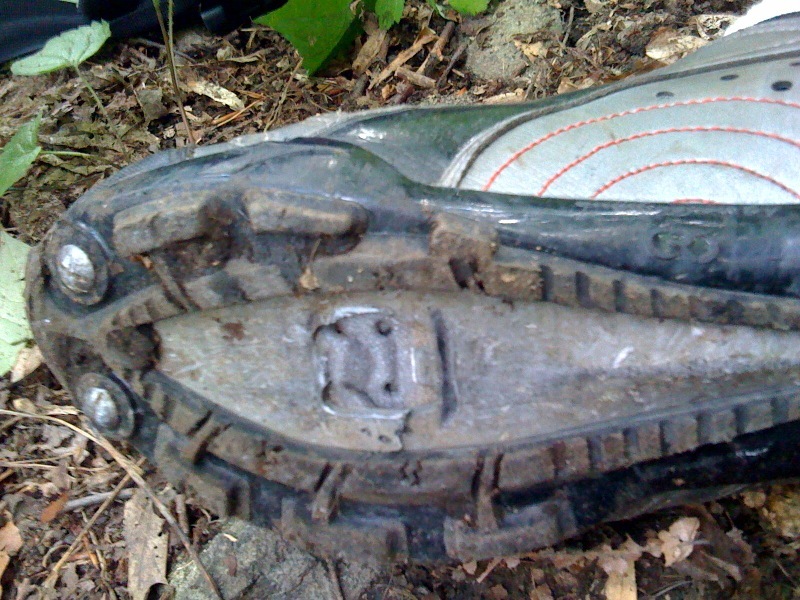 The cleat departed from my shoe and remained in my Crank Brother pedal. It tore right out of the shoe, taking some of the sole with it. So much for my riding this Saturday. To remove the cleat from the pedal, I used my left shoe to clip in and then almost clip out again. 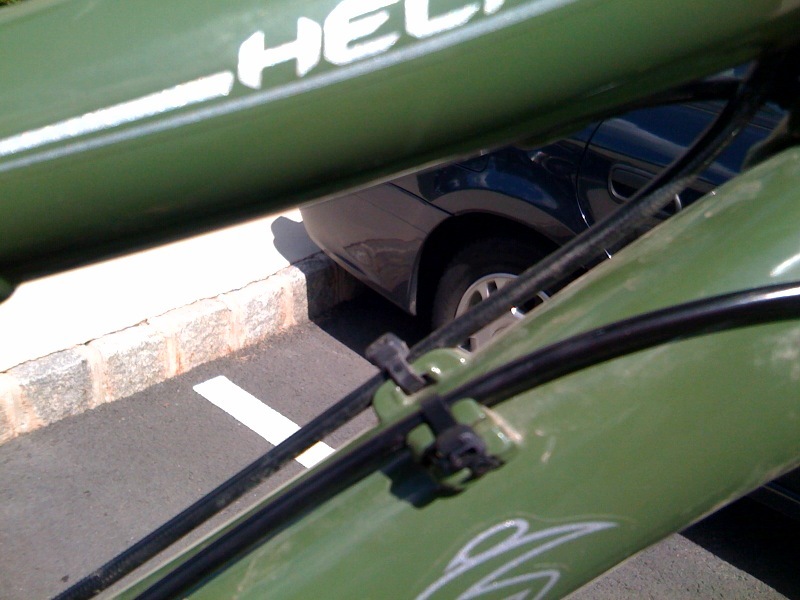 This loosened the grip and I was able to retrieve the dead bits. 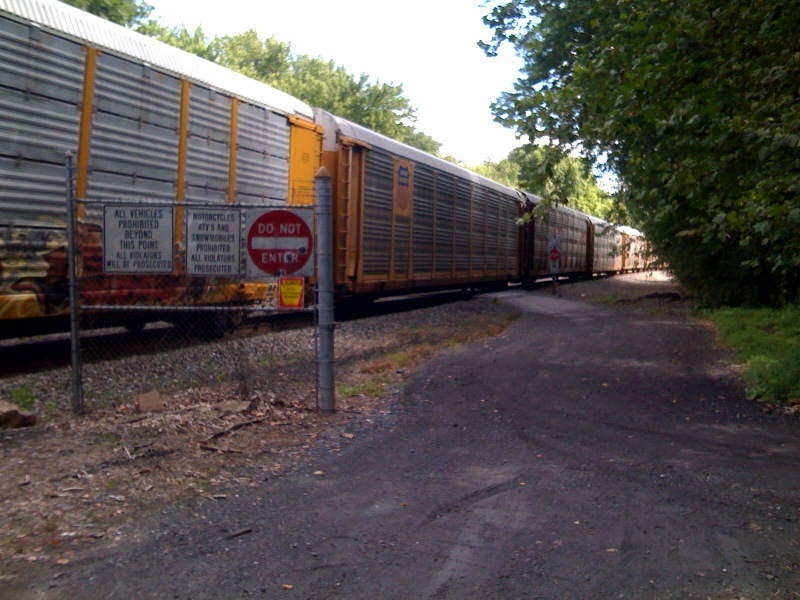 We rode back to the cars along a gravel and then paved road. All up, it was 2 minutes to the road and about 15 minutes back to the cars. Lucky me. It could have been quite a hard slog along some rocky sections. 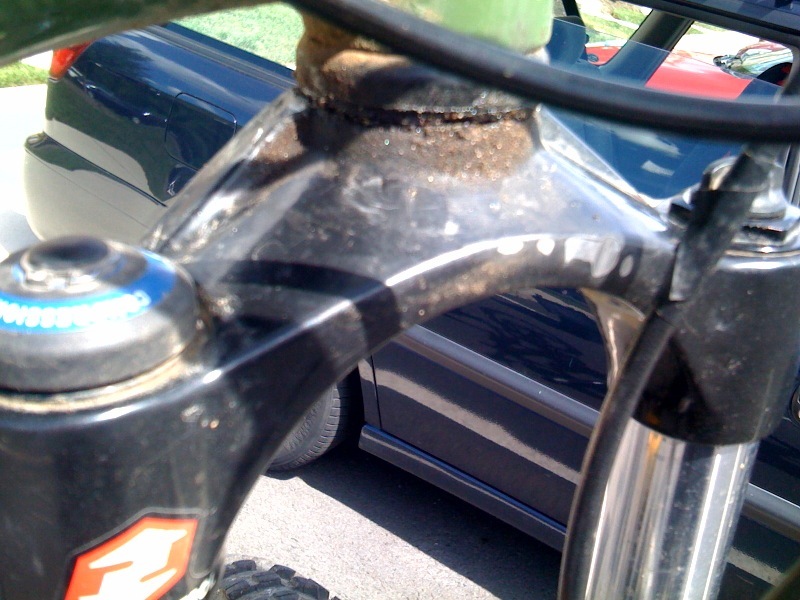 I would not have enjoyed that with only one foot attached to my bike. On the way home, I stopped off at Guy’s Bicycles, where I bought the shoes. They warrantied the shoes as they were only 2 or 3 months old. In addition, they let me pay the difference and upgrade my shoes. Upon arriving home, I did some bike maintenance and noticed how poorly the cable ties had been done on my recent rear derailleur cable replacement. 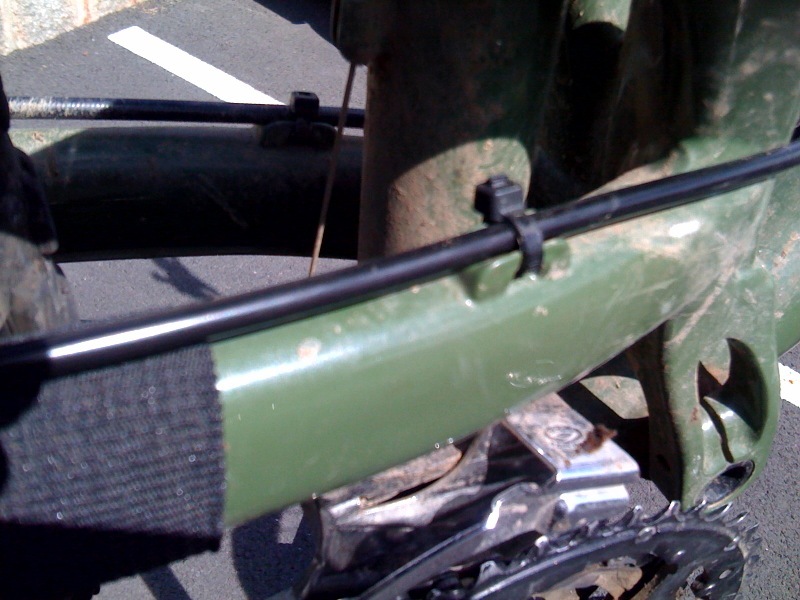 Cable ties should always be snipped flush, otherwise you can take a nasty cut from them, either while riding or during maintenance. These things are major paper cuts just waiting to happen. 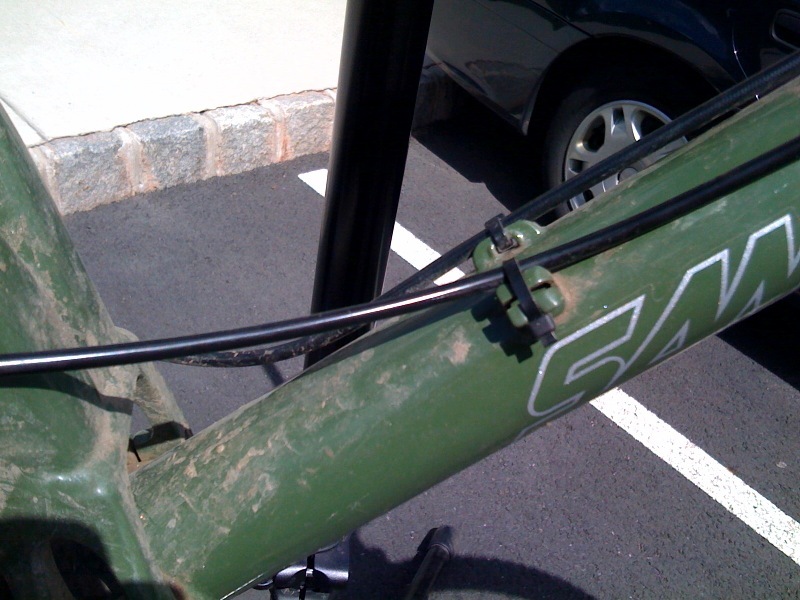 And, for what it’s worth, I also noticed much the cables have worn into my front fork. I also decided that it was time to replace my rear rotor. It was suffering from a bad case of the bends. Calling around, I found Guy’s had one. I drove there, they replaced the old rotor on the spot, and I continue on to a BBQ. I arrived about 5:30 pm after my bike maintenance and last minute dash to Guy’s. I stayed until about 7:30. Good food. Good friends. Great hosts. Oh, by the way, Bruce’s son, Matthew, 15, accompanied Bruce to OSCON this year. Matthew won the big prize. Collect all the stamps from each booth, go into the draw… that type of thing. He now has a workstation more powerful than his fathers. This morning, on 276, I stopped my car when I saw a nun in a white habit standing by her car at the Doylestown exit. She ran across the exit ramp to speak with me. She wanted to know if this was the exit for 611. I confirmed, yes, it is, turn right after the toll booths. She asked me my name, shook my hand, and told me she’d pray for me. :) I can use the help. 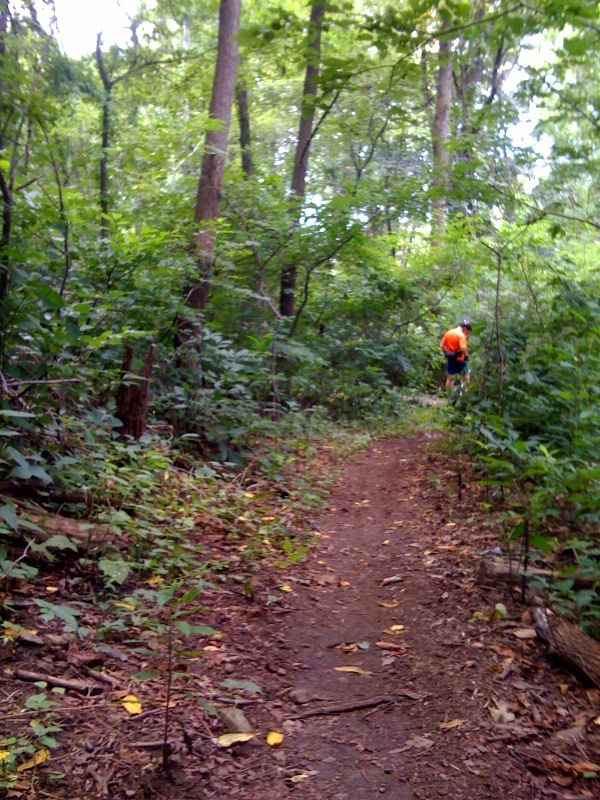 Late this morning I attended the skills session put on by The Philadelphia Mountain Biking Association. We waited 30 minutes or so for the rain and thunderstorm to pass. Then we rode. The advanced group didn’t really do much in the way of advancing my skills. 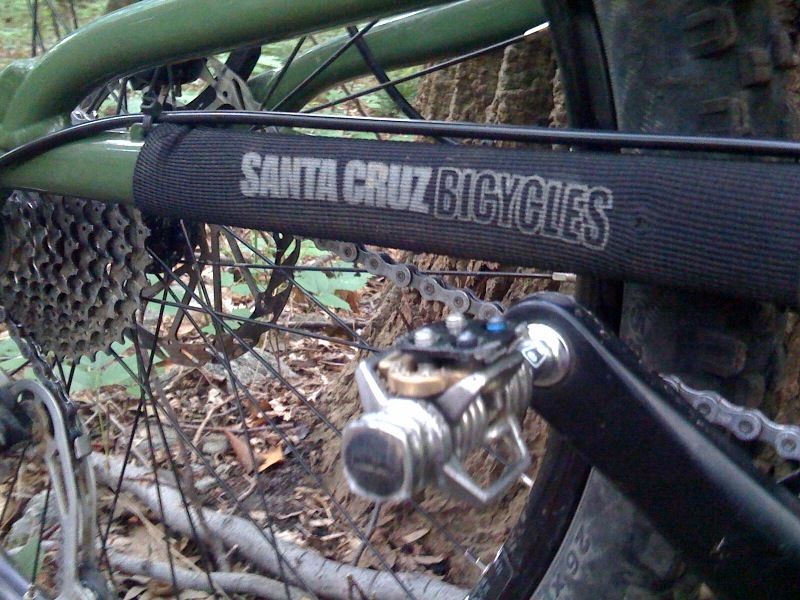 But we rode pretty hard and on some trails I’d never been before. On the way back through the Valley Green parking lot, I saw a branch laying on the track and told the guys to stay off my right. 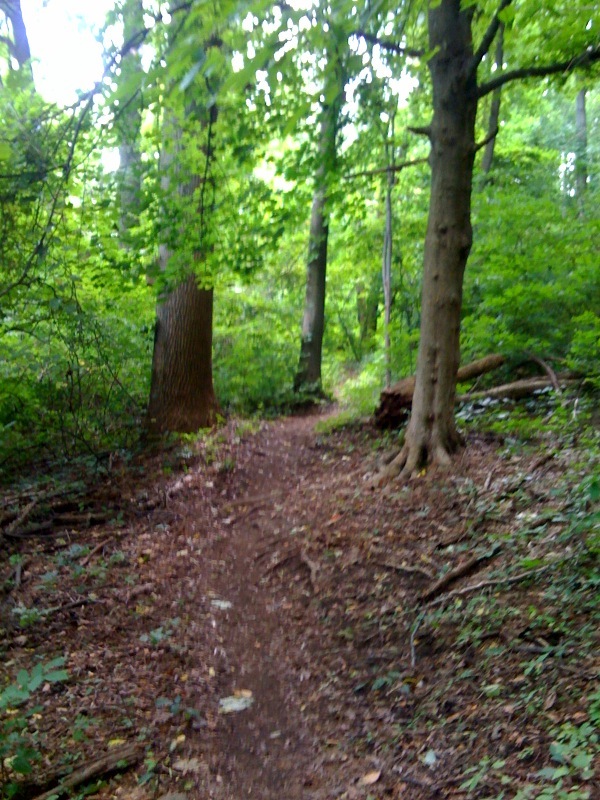 They thought I was going to stop, but no… I unclipped my right foot and deftly kicked the 2 inch log off the trail. They were impressed. We started coming up with names for this. I figured ‘non-stop trail maintenance’ was the winner. From here, it was back to the departure zone where pulled pork sandwiches, salad, and refreshments of the liquid sort awaited. Good times.